With the recent huge increases in energy costs, figuring out how best to conserve energy and improve comfort in a home has become an urgent issue. Using blower doors, infrared cameras, and a wide variety of other high-tech equipment, home performance contractors can diagnose and fix home comfort problems that would otherwise cause premature deterioration of a home. But if you live in an area that experiences cold, snowy winters, you can make a preliminary evaluation without using any high-tech equipment. By knowing how to read the snow, you can get an idea of where you may be losing valuable heat. If your home looks like the one above, quit worrying. Note the even, continuous blanket of snow. There are no icicles visible. This attic is well sealed, well insulated, and ready to shelter this home for years of warm, comfortable homeownership. 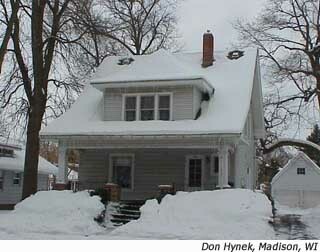 Some homeowners express concern about the weight of this much snow on a roof. However, this snow does not need to be shoveled off. A structurally sound roof is built to handle at least 30 pounds per square foot of live load. It would take several feet of snow to create even a minor risk. It's safe to bet that this attic is completely uninsulated. The only snow left on the roof is out on the eaves. 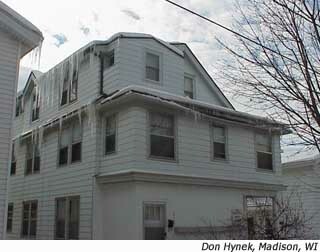 The massive icicles indicate that this home is very vulnerable to ice damming and roof leakage. 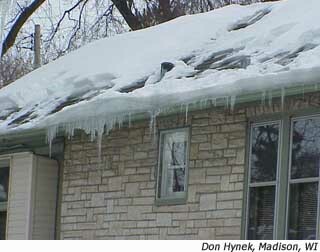 The damage starts with rooftop snow melting and then freezing when it reaches the cold eaves. 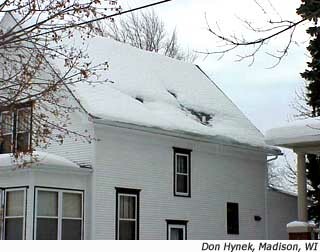 As more snow melts and pools up as liquid water behind the frozen ice dam, this moisture can seep between the shingles and into the roof cavity and wall. Insulating this attic to R-38 would probably save this homeowner hundreds of dollars a year in heating and air conditioning costs and would make this home more comfortable as well. We insulate attics to keep heat from escaping out of the living space and to keep the attic cold and dry. Most homeowners understand that. However, insulation is only half of the protection that a good attic needs. Insulation doesn't stop air from leaking and taking heat and moisture with it. A home performs well only when both heat and air are controlled. The roof vents near the peak are there precisely to make sure that any warm, moist air leaking into the attic escapes before it can rot roof materials. 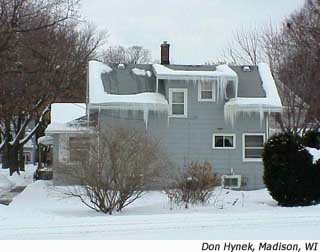 The huge halos of melted snow around these roof vents are much larger than they were on any other house on the block. The roof cavity is staying cold (note the lack of icicles on the eaves), but a substantial amount of heat is escaping unnecessarily out through holes in walls and ceilings, into the attic, and out the roof vents. This not only wastes money and energy, but the moving air also creates drafts and cold spots in the home. Air leakage into the attic can create other problems. If it happens in just small, concentrated areas, it can promote structural damage as well. In the home below, the air leakage is just in a small area around the sewer stack (the pipe sticking up). Note how thick the ice is on the eaves, especially just below the pipe. Closer examination showed that the rain gutter is already damaged, and the shingles and decking under all this ice may be damaged, too. Sometimes, the damage is a lot more obvious. The photo below is of a small apartment building that was once a large single-family home. The living space-in what used to be the attic-is wasting an enormous amount of heat, as is obvious from the huge mass of icicles on the left. The second story porch that was enclosed to make more living space is, however, the real culprit. The snow melting off the roof has created a mass of ice that has pulled the rain gutter and the entire fascia right off the rafter ends. Now the entire roof cavity is open to the snow and wind. And let's take a guess what will happen when a family of squirrels decides to move in! Not only is this building significantly damaged, but it probably did not perform all that well before the snow started. The amount of ice on the top roof suggests that there is a lot of uncontrolled air leaking through the walls and ceilings of this building and into the attic. 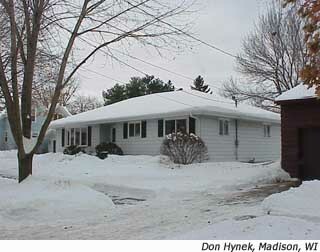 As the warm air escapes out of the top of the building, cold air is sucked into the basement and first floor. The continual migration of air in, up, and out ensures that all the humidity in the home ends up as frost in the attic. So all of the rooms are uncomfortable; too cold on the first floor, too warm on the third floor, and too dry everywhere, all winter. Here's another interesting remodeling job. This home was once a cozy little bungalow. Then the owners hired someone to build a small second floor room and install two great skylights. The short sidewalls of the added upstairs room (called kneewalls) are almost always a place where a home's performance and comfort get compromised. In this home, the small attic at the top of the house is well insulated and sealed, as is clear from the full snow cover there. However, the sloping ceiling, where the skylights are installed, is the site of some snow melt, and the space below the skylights looks as though it's insulating value is very poor. Looking very carefully just below the skylights, it's clear that the rafters are the best insulation in that area. You can see their ghostly imprint where lines of snow are still sticking on the almost bare roof area. The consensus is that this home almost certainly has an upstairs bath that is really uncomfortable. Three different, very localized warm spots suggest strongly that air leakage is the problem. There is a substantial leak where the sewer vent (white pipe) goes through the ceiling and roof, and another where a ceiling lamp is installed and leaking air into the attic. The third melt spot is probably where a poorly installed bath fan is blowing warm, moist air into the attic. As a result, the bathroom is drafty, the roof decking and rafters are deteriorating, and the ice dam forming on the eave is damaging shingles, roof decking, and the rain gutter. 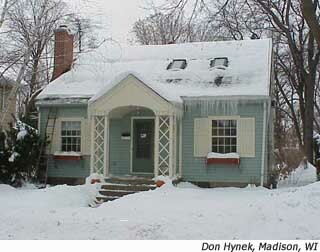 In short, the snow on your home's roof can tell you a lot about how the building is performing. Taking a walk through your neighborhood, to compare your home to others experiencing the same weather conditions, can be a very educational experience. If it helps diagnose defects that are affecting your home's performance, it could be a very profitable experience, too. If you spot patterns that lead you to believe your home needs improvement, try to locate a home performance contractor. Their recommendations can guide the transformation of any home into a more comfortable, safe, durable home.